The hat, the glasses, the cheekbones, and of course the setting in an entomologists gallery. Vector 13 is creepy stuff. I don’t suppose people debate the topic much, even on the dustiest corners of the internet, but it seems to me that Ridgway has the accolade of being the best artist at drawing both young children and very elderly folk. You could argue about if he’s also the best at drawing grizzled, manly men, but his name belongs in that conversation, too. What it is, is work is full of lines. Wrinkles, stubble and individual hairs most obviously, but also just a generally sketch-like quality to all his work. There’s also a facility with horror, atmosphere, and grounding things in nature. He surely has drawn more trees and rustling leaves than any other 2000AD art droid. This is a dude who really takes delight in carving out a person's heart. 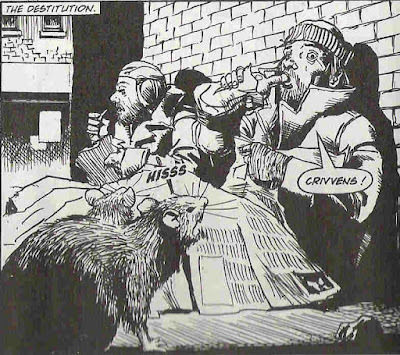 I don’t know Ridgway’s work outside of 2000AD, but I’ve an idea he was something of an old hand in the UK comics scene before he was tapped by Tharg, along with the likes of Arthur Ranson and John Burns. He always had that feel of a seasoned pro who just knew what he was doing, and knew who he was doing it for – namely, young boys who wanted cracking adventure stories that didn’t talk down to them. 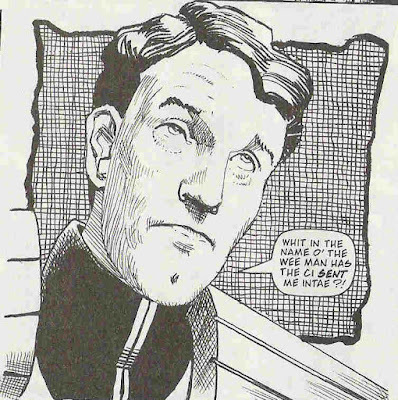 In fact, on that point, Ridgway himself said in a Megazine interview that he specifically preferred to draw stories aimed at this audience, and didn’t care for the adultification (or whatever the word is) that was en vogue in UK comics of the late 80s onwards. 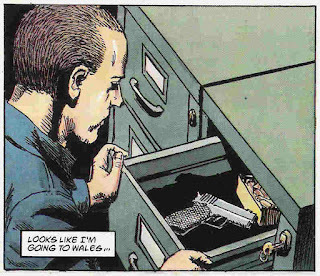 Its apposite, then, that Ridgway’s work for Tharg during that period was consistently excellent. 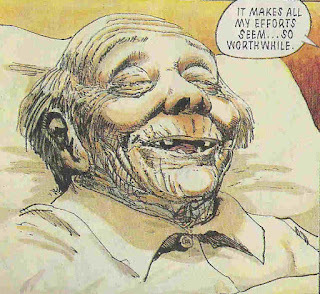 The children/old people thing came up almost from the beginning with Ridgway, notably on one-off spooky tale Candy and the Catchman, which is sort of about the fear of ageing (as only a lifelong aesthete like Grant Morrison could feel that fear). 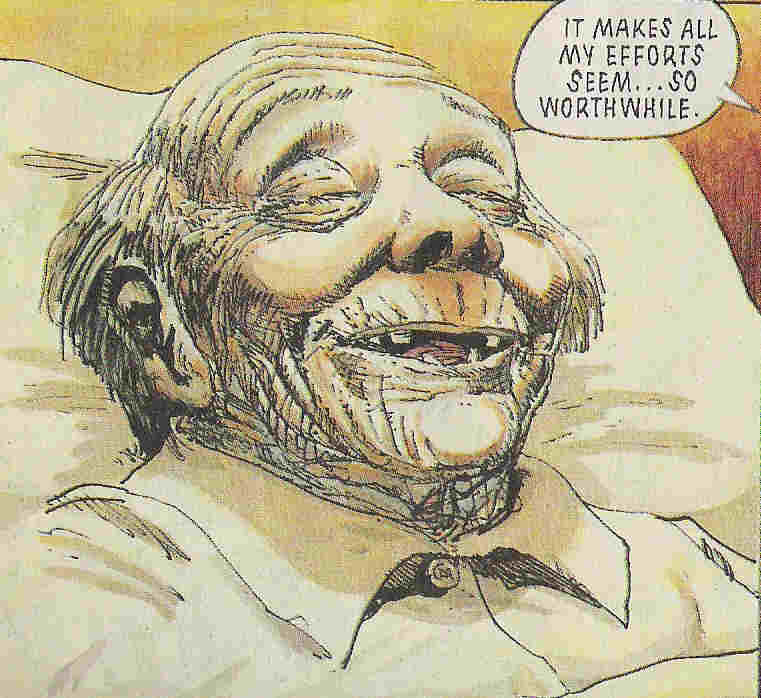 Moving onto Judge Dredd, Ridgway was, I think, one of the first to really get behind the notion that Dredd himself was entering late middle age. No less healthy or athletic in build, but certainly more wrinkly of chin. Under Ridgway’s pen, Dredd’s foes aged up a bit, too. The Raggedy Man is of indeterminate age, but his demeanour gives the same vibes as that of a retiree. And, yes, a touch of horror. Miss Marple, over in Alzheimer’s Block, is a true retiree. This provides a perfect example of marrying the right artist to the story. It’s a straight forward mystery with seriously spooky overtones, but a rich vein of comedy all the way through. At the same time, Ridgway was marking quite a mark with a story that seemed to come somewhat out of nowhere: Summer Magic. Once again, it combines a convincingly rendered child – young Luke Kirby – with convincingly rendered grown-ups (his mum) and slightly creepy older people (his mysterious uncle). 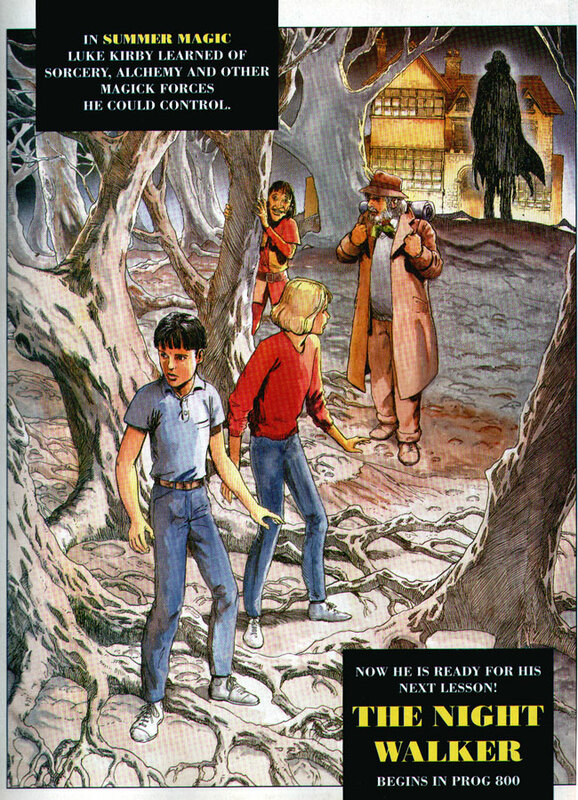 Also, werewolves, trees, night terrors and just a superb combination of adventure and horror. Luke Kirby: a bored child looking for adventure. Luke Kirby has found adventure - but can he handle it? Luke Kirby’s further adventures retained a certain charm, and an endless grounding in the natural world, but I’m not sure he ever topped this first foray. 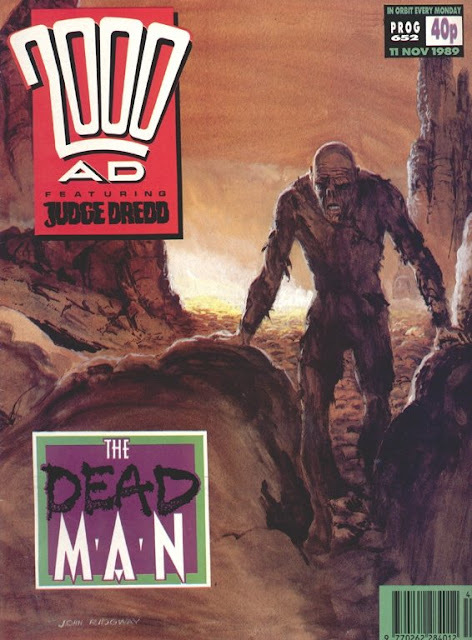 The Dead Man. The Deam Man! How bloodty great was that series - and how amazing that it holds up so well on re-reads, even when, at the time, it was all about the mystery of 'who is the Dead Man?'. Another boy hero for the ages, Yassa Povey. Two amazingly horrible villains in Nausea and Phobia. Yet more bug-eyed terror. And a hideously scarred eldster in the title role. It's a masterclass in storytelling, and also straddles the line between adventure and horror. Ridgway’s next co-creation was far less well feted. Yes, it’s Junker, occasional contender for worst ever series. But not for the art. 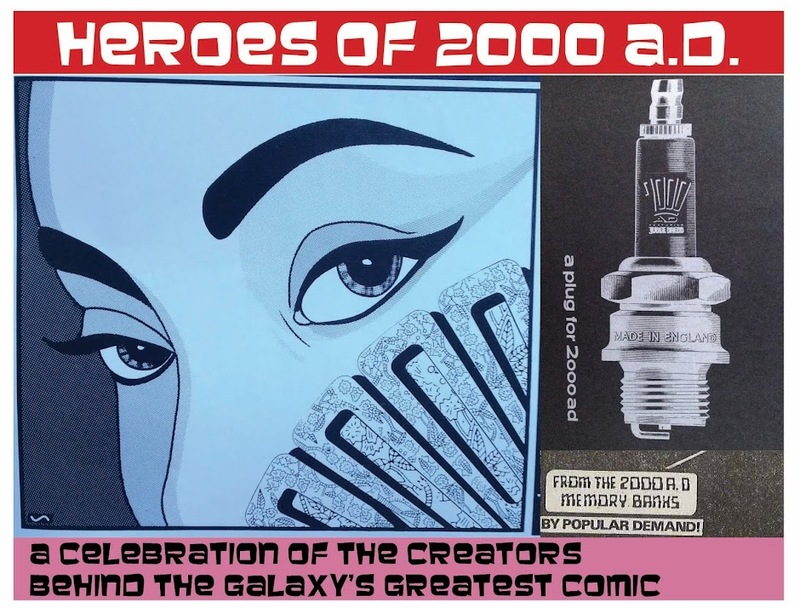 Ridgway constructs a generic 2000AD-lite grizzled antihero, and teams him up with a sort of rat-lizard (actually quite fun), and a scheming alien princess. It’s all a bit Star Wars (or possibly a bit Firefly, if that show had existed a decade earlier). Junker doesn't trust women. Raz is more intersted in food. Notoriously, Ridgway had to cope with scripts that demanded impossibilities such as the hero shooting from the open window of a spaceship in space (or something like that). He makes a game effort of it all. More on the story itself in the upcoming entry for writer Michael Fleisher, but in tone, there’s nothing really wrong with Junker, certainly as drawn by Ridgway. Certainly I was into it for the first half, at the time. This story, and Ridgway generally, felt like they were my 2000AD (as a then 12/13-year old). Much more accessible than snide-y / arty stuff like Time Flies or Hewligan’s Haircut that Tharg seemed to like so much in the Nerve Centre. Junker's still not too sure about women; Ridgway is possibly starting to care a little less at this point, too. With a pro like Ridgway, you’re going to get solid storytelling, well realised scenery, a range of emotions from the characters, and bursts of tension. 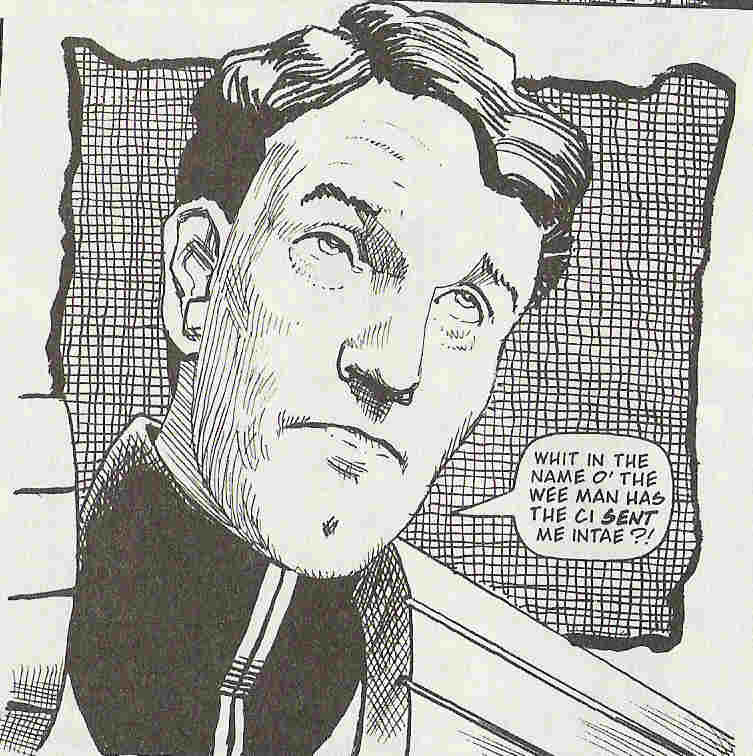 See also Calhab Justice, which Ridgway spearheaded over in the Megazine. Lots of promise, especially in the art, slightly let down by a script that, to my mind, needed stronger editorial guidance. Or maybe I was the problem, not really having any context for concepts around whiskey clans and stolen scone stones, being as I am a dirty Euro-Souther**. Once again, Ridgway delivers on the natural world, setting scenes in the highlands. But what shows up more in this series are his people. There’s a lot of shouting, emoting and indeed laughing. An early Christmas (well, I guess technically New Year’s) episode was particularly effective at setting the overall tone, which balanced out the sense of Cal-Hab as a neglected, impoverished place with the inherent warmth and comedy of the characters. It all went a bit loopy after Ridgway left, which may or may not have been a factor in why he stopped working on the series. Darkness Visible arguably functioned as a more fleshed-out version of Vector 13. It followed private investigator Alec Holland, who could have gone on to pursue all sorts of UK-based goings-on, but as it is we only got to read the first half of a mystery about a cult. Ridgway is the man to do this sort of gentle, dread-based spookiness (ably helped by colourist Gina Hart, who seemed, in the end, a better fit for Ridgway than Tim Perkins, who he previously been paired with on Junker and various Dredds). 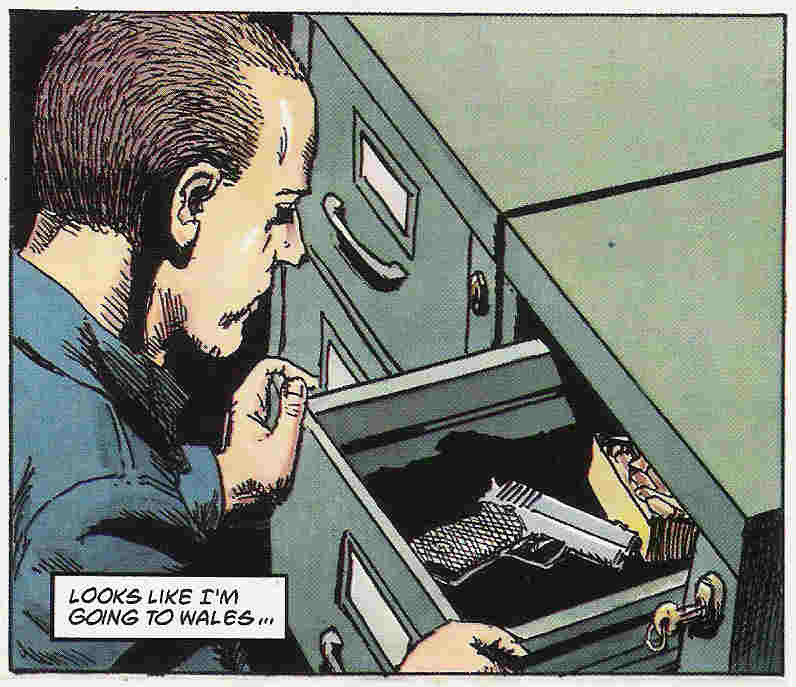 Yup, you'll need a gun if you're going to Wales. That seemed to be it for quite a while – until we were gifted with a burst of activity in the new-look Megazine of the Alan Barnes era. 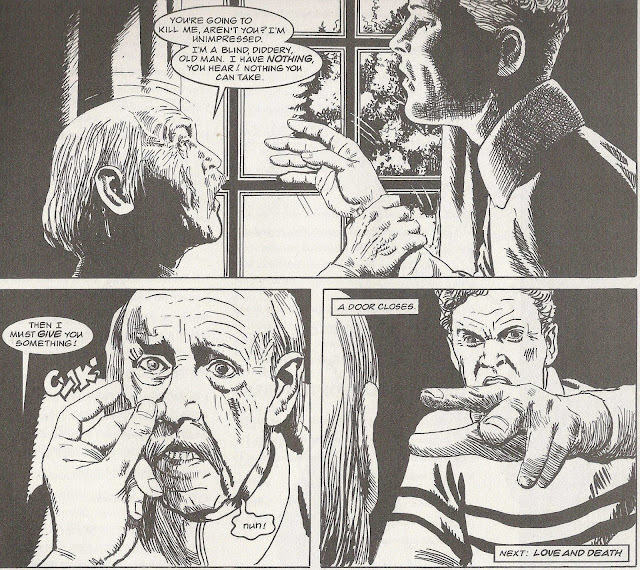 After a sustained dodgy period, artwise, (rather a lot of Volumes 2 and 3) the Megazine looked to old hands such as Ridgway to bring it back on course. And so we got to see the man’s take on Missionary Man, Armitage and Young Middenface McNulty. Sometimes, a cry and a cuddle is what you need. We don;t see nearly enough of this sort fo thing in comics, I reckon. Once again, it’s the scenery that sticks out in my mind, along with the emotional core of the characters. If there’s one thing I haven’t explored so far it’s the fact that Ridgway’s style is really not like anyone else (Vince Locke, maybe?). It’s not at all flashy. At times, even, it can look a little childish – I can certainly imagine the Bisley-o-philes of 1989 wondering why someone who art was, for want of a better word, uncool, was getting so much work in the Prog. I’ve been guilty of thinking those thoughts, too – but every time I’ve read a Ridgway story, I’m always struck by how visceral it really is. The leering stare and the reaching hand - simple drawing, super effective character-filled stroytelling. Yes, sometimes, the poses are a little stiff, and sometimes the wrinkliness of the skin seems too much – but damned if it doesn’t sell what each character is thinking and feeling. And damned if it doesn’t push that envelope to extremes that few other artists reach. H’mm, Defoe needs a new artist – I wonder if it might find a happy home with an old master..? A vision of hell on earth. It's the greedy boy with the burger that gets to me most. **Half German, Half English, essentially lived all my life in London in case this helps put my opinions in a useful context. ***Tales from the Black Museum in the Meg has been pretty amazing, too, although it’s had far fewer entries to compare. It was a tremendous thrill when I heard I'd be working with John on Calhab. I was a big fan of his work on Hellblazer previously. He was too busy to continue on the strip and Lol took over. In fact it was Lol turning down Family Snapshot that allowed John to return to the strip if only for a short time. Mind you, he was disappointed on his return at not having many opportunities to draw Judge Ed MacBrayne (who is sent away on Page 1 of Family Snapshot). 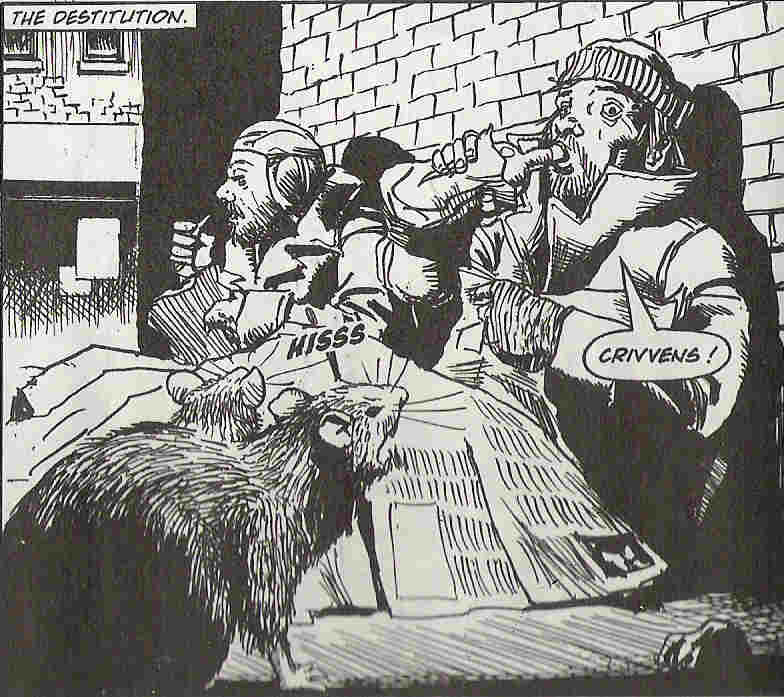 The more articles eulogising John as one of the great comics artists the better.